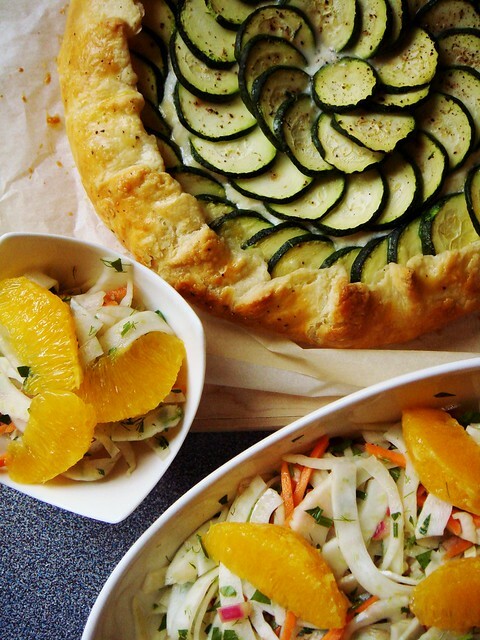 Most cookbooks would tell you that a galette is rustic, casual, and easy by comparison to tarts or pies. There is no moulds to fit, no neatly trimmed edges to crimp. I never believe them even for a second. 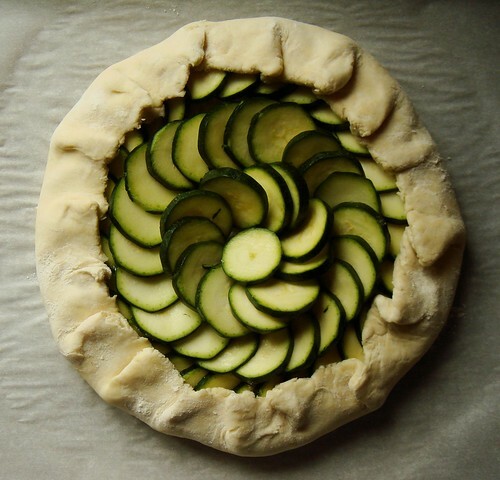 The fussiest part is never about fitting dough into a pie plate or a tart pan! That is only the last trivial detail. I don’t like making pie dough because it requires rubbing butter into flour, keeping everything cold, delicately forming a dough without under or over handling, and getting my rolling pin dirty! Even with a “rustic and casual” approach, those steps are inevitable. Two things changed that made my pastry experience on Saturday so much more enjoyable. First, I started using high butterfat butter about 6 months ago. It is more pliable and much easier to work with in a pastry dough. Secondly, I took the casual mentality by heart and didn’t care much about the outcome. So be it if I worked the dough a bit too much: it was only dinner with Little Brother. Somehow, my dough turned out perfectly flakey and tender. I bet I will not replicate this result next time when it counts (i.e. when I plan to serve it to company). 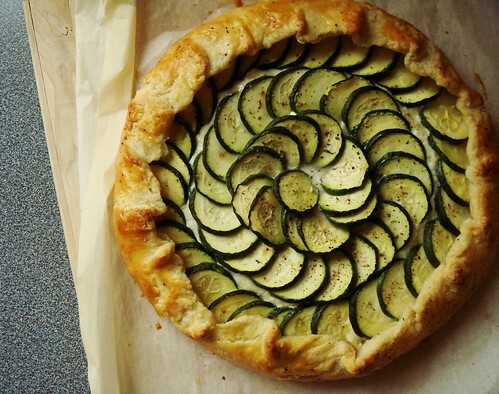 Everything went right with the making of this zucchini ricotta galette. I somehow rolled the chilled disk of dough into a perfect circle. I sliced thin coins from two zucchinis and every slice fit into the filling. The three cheese filling of ricotta, parmesan, and mozzarella added just the right amount of richness without overwhelming. It was simply one of those blissful cooking moments. 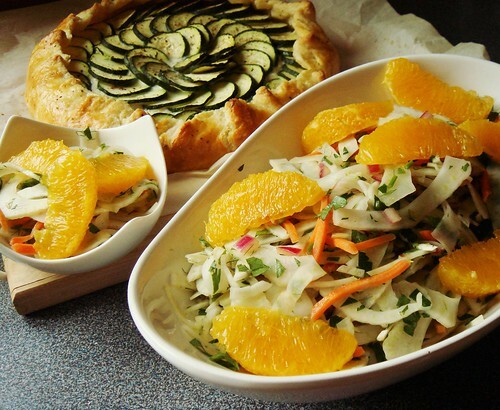 I made an Orange Fennel Salad to accompany the galette for dinner. First, I marinated red onion in sherry vinegar. While that was happening, I tossed paper-thin slices of fennel, carrot matchsticks, fennel fronds, and chopped parsley in a salad bowl. I supremed a navel orange too and squeezed the remaining juice into the onions. I finished the vinaigrette with a drizzle of olive oil. The salad tasted refreshing even though it was made with winter ingredients. My galette and salad dinner seemed like an appropriate welcome to spring even though it was still rather chilly on Saturday. 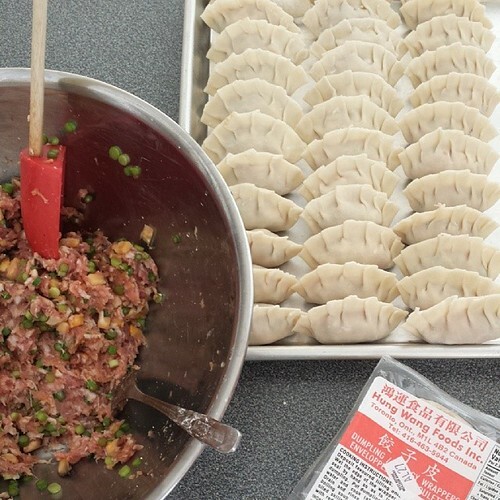 Sunday I kept myself busy with the ultimate mind numbing task of dumpling making. It was repetitive, it took a long time, and oddly relaxing. I mixed a big bowl of filling using fat and lean ground pork, garlic scapes, and fresh shiitake mushrooms. I have a preference for filling with pungent taste. After that, it was a simple process of fill, seal, crimp. Repeat that 120 times. My dumplings started off a bit lopsided. By the time I was half way through, every little parcel looked uniform with 7 pleats evenly spaced and a plump belly. I was going to just stock the freezer but it was hard to refuse a dinner of freshly made dumplings. 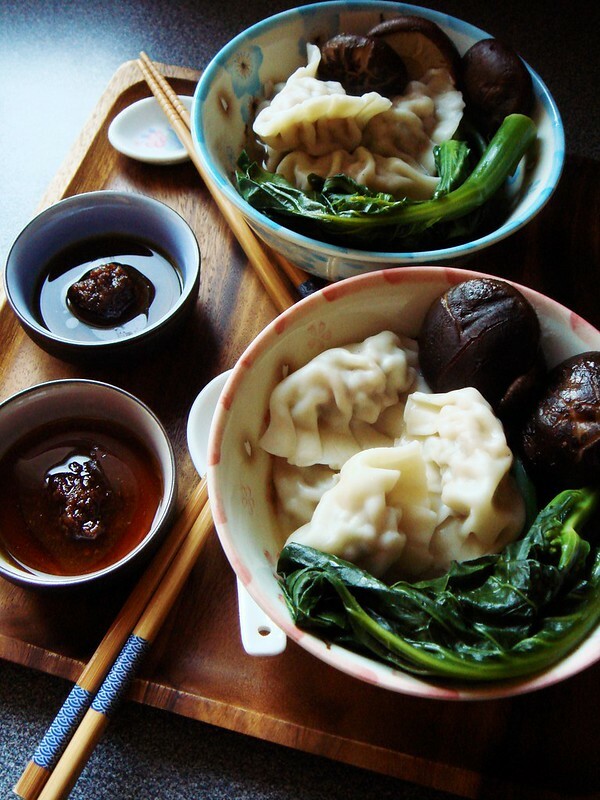 Instead of reheating leftover galette, Little Brother and I had a Sunday dinner of dumplings in chicken broth with gailan (Chinese broccoli) and shiitake mushroom. I hope to be healthy once again so I can get back to exercising. Feeling restless and anxious does not suit me well, with or without comforting family dinner to enjoy.